In a clearing we found him, after walking for hours in the forest. Some had strayed early, their mission forgotten, others gave up to return to the comfort of the village hotel. But I kept up with my fellow seekers, finally reaching the dark clearing where we saw the Stickman - ancient and rickety, terrifying in his otherworldly frailty, jauntily poised on the rock that the villagers claimed was life-giving. “Now listen,” he said as we gathered before him. His voice was a sigh, a wind calling through caverns, a rush of tiny pebbles down a steep gulley. 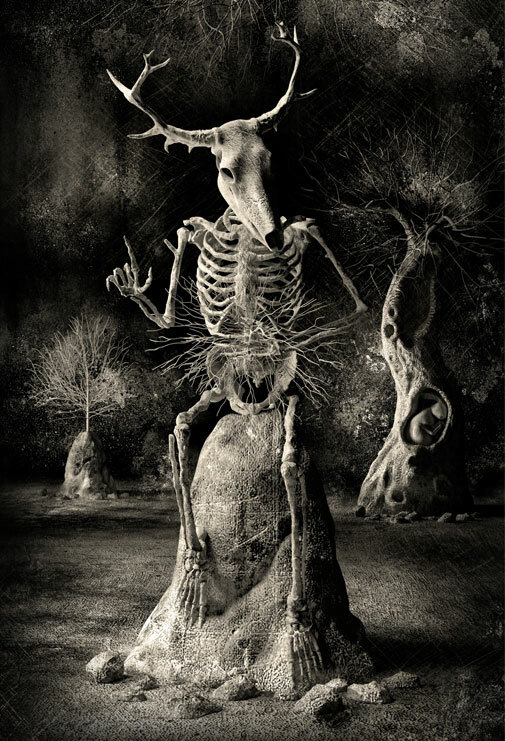 We stood transfixed by his breathy incantation, our gaze level with the tangle of roots, veins, ganglions sprouting, a shriek of pain at his centre, a girdle of anguish. But the rock held up his stick-bone frame of smooth-rubbed branches, like baked clay filaments, hard and easy to shatter. “Tell us what to do, should we leave our towns?” a woman asked. “Should we live in the forest?” another pleaded. Then he stood and walked away, those disconnected fragments of bone-china limbs cohering to make movement, the core of pain a furred silhouette. He leaned into the tree of his child and disappeared. There was a silence. We turned to each other, expressionless, longing. Standing at the edge of the clearing we were more distant from the Stickman’s world than before we came. “He could have said a little more,” a woman grumbled. “What did he mean?” another woman murmured to a man whose hand she was clutching. He shook his head, disgruntled. Had he been made to accompany her to the stickman’s clearing? Or had he cherished secret hopes of his own as they travelled to the village with its windows full of postcards and stick souvenirs, cafes and restaurants and the hotel with the bar always open, the serving-staff bored beyond tears faking interest in our stories, encouraging us with their false enthusiasm. “Walking all this way for nothing,” someone complained. They headed back to the village together, a group now, a gaggle. I waited at the clearing. Would the Stickman return and resume sitting? Could I face him alone, with no others of my kind around me? The forest breathed, rustling up high, the tops of the firs rippling against a faraway sky. The unborn in its hollow adjusted a single flaccid limb then grew still again. I reached out to the rock and touched it. Rough and porous, dry-pitted, it felt of new concrete and old stone churches and the moon.